We'd be lying if we said we weren't a little happy to see 2010 go. It's been a really difficult and trying year, if we're to be honest with you. Don't get us wrong, it's also been full of wonderfully happy and fun moments, but to call it anything short of a rollercoaster ride would be an understatement. January: This time last year we made the offical decision to move abroad. We assumed it would be an 18-24 month process and started the wheels in motion by putting our house on the market. Based on things we were reading and seeing on TV, we thought it would take a good 6 months to sell. Seven days later we had an offer...leaving us only a few weeks to find a new place to live. Oh, and January was the month Kate left her "real" job because her consulting business took off. 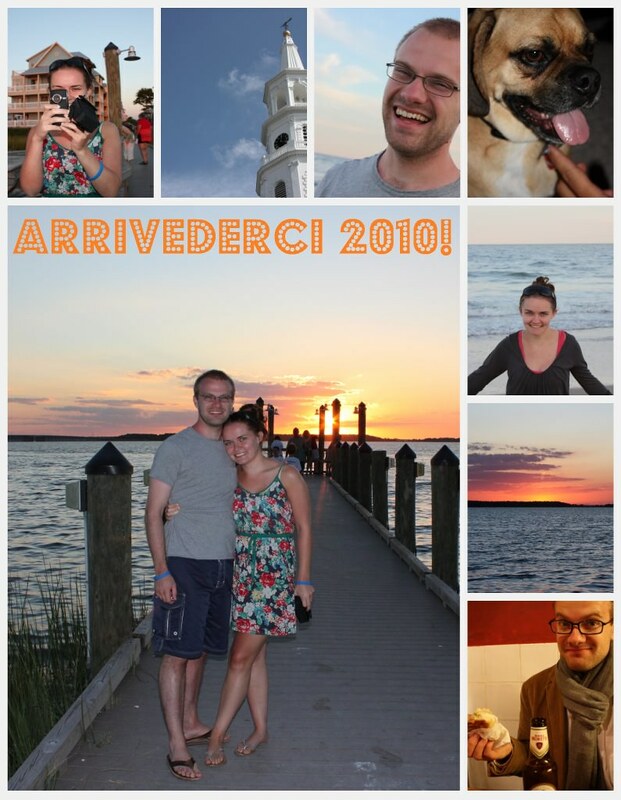 February: Said "Arrivederci" to our cute house in the Highlands neighborhood of Louisville, rented an awesome downtown loft (which wasn't meant to be, as you'll read later) and dove head first into the Italian dual citizenship process. At some point before we moved into the loft we tried to buy a condo, which fell through thanks to some higher power watching over us. March: The first issue of Southern Flourish debuted to great success and a few weeks later we were off to Jamaica to celebrate Kate's parents' 30th anniversary. Rumor has it Rob got so toasty on the third day that he couldn't drink the rest of the trip. It's a rumor, that's all I'm sayin'. April: Rob tries to go down to part-time so he can help Kate with her business (rejected! ), so he starts helping on nights and weekends. Around this time we began to realize our luxury loft rental wasn't all it was cracked up to be. May: The month started out great when we went to the Kentucky Oaks with our good friends for the second year in a row (and won no money for the second year in a row). But, as the situation at the apartment deteriorated, we decided to move from Louisville and -- holy cow -- push our move date to Italy up by an entire year. June: Moved to the Philadlephia area, crashing at Kate's parents' house. For those keeping score, it was our second move in just a few months. Moving = Awful, just in case you were confused. Rob also started working with Kate full-time and we LLC'd our new business venture together. July: Realized a November move to Italy was not going to happen (thanks mostly to Pennsylvania being super slow with getting us vital records) and pushed the move back to January. We bought Kate's dad some tequilla to compensate him for invading their home for another few months. August: August was really tough. Really, really tough. We lost Rob's dad early in the month, which broke our hearts. We spent some time in Indiana with family, before taking another trip to Charleston for a Southern Flourish photoshoot. It was a welcome distraction at such a stressful time. September: Early in September we went to Ocean City, Maryland with Kate's sister and her family. We lounged on the beach and tried to relax. At this point, the stress of the year was really starting to take a toll on us. Also in September, we became convinced that dual citizenship would never work because we could not get documents fast enough, so we plotted a move to Charleston. October: Like magic, the documents we needed for Italian dual citizenship started arriving en masse in the mail. We went from convinced it wasn't meant to be, to actively planning the move again. November: What a crazy month! We spent time in Washington, DC for work, Rob visited family in Indiana and in the middle we took an apartment-hunting trip to Florence! The month was super busy, but also extremely successful. There was a real sense of accomplishment in this month and it's when we really started to feel that 2011 would be a special year for us. Rob turned the big 2-6! December: This month has just FLOWN by. We celebrated Kate's 27th birthday, went to Washington, DC for a wonderful wedding, visited our good friend Ed, and Rob's mom came out to spend Christmas with the crazies (also known as Kate's family). So, that was our 2010. We moved and traveled so much that we're pretty sure Winston thinks he's a hobo. Thank goodness he is a dog that can adjust fairly easily and isn't too neurotic. We cannot wait to see what 2011 has in store for us. We haven't outlined any particular resolutions, but we plan to spend most of year right in Florence. We have tons of places we want to see and things we want to do, but we saw how 2010 simply wore us out, so we're looking for this coming year to be a bit quieter.